The long, pale green fibrous stalks of celery make for a refreshing addition to a chopped salad as well as a low-calorie snack. Blending the stalks with fresh water will make a fiber-rich juice that is filling and healthy, making it ideal for a weight-loss plan. Blend 1 cup of chopped celery with 2/3 cup of water to create 1 1/2 cups of fresh celery juice. If the consistency is too thick for you, thin it out with a bit more water, but don't strain the juice or you'll lose out on its fiber content. Celery juice, like celery, is very low in calories, with only 16 calories per 1 1/2 cups of celery juice. It contains less than a gram of protein and only 0.17 gram of total fat. In addition to helping you reach your recommended intake of 2 to 3 cups of vegetables per day, celery juice can also be a healthy substitute for more high-calorie flavored drinks, such as grape soda. A 12-ounce serving of grape soda, for example, has 160 calories per serving. Even substituting one serving of celery juice per week for a year would lead to a total loss of 7,488 calories, the equivalent to a little over 2 pounds of body weight. Celery has a high dietary fiber content, which makes it feel filling. A 1.5-cup serving of celery juice made in a blender to preserve the fiber content has 1.6 grams per serving. This is 4.2 to 6.4 percent of the recommended intake of dietary fiber. Dietary fiber provides bulk, helping reduce the chances of overeating. Straining your celery juice or using a juicer instead of a blender will reduce your dietary fiber content by roughly half, as all of the insoluble fiber is removed. Celery juice is high in vitamin K, with a 1.5-cup serving containing almost 30 micrograms. While vitamin K does not contribute to weight loss, it is essential for healthy blood coagulation and is key to helping prevent osteoporosis. A single serving of celery juice provides 25 to 33 percent of the adequate intake of vitamin K per day. 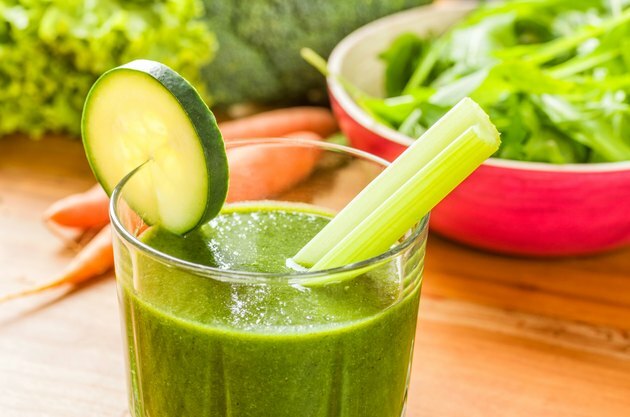 You can combine your celery juice with other fruit or vegetable juices, such as carrot, pear or beet, all of which will add a hint of sweetness to the juice while keeping it a nutrient-rich drink. Other serving tips for mitigating the strong taste of celery juice is to add a teaspoon of cayenne pepper to it to create a spicier flavor. Chili pepper, like cayenne, also has the benefit of increasing your metabolism, which can help quicken the weight-loss process.